It’s an exciting time for revered Toronto guitarist Donna Grantis as her debut solo album, Diamonds & Dynamite, just dropped last week via eOne Music (grab your own copy here). Grantis’ musical prowess and her wide array of influences help define Diamonds & Dynamite as one of the year’s most memorable releases. The record is rooted in jazz improvisation and contains vibes of new era jazz-rock fusion, illustrating why Grantis is one of today’s most exciting musicians. Grantis is no newbie to the industry, though, as she is perhaps best known as the co-lead guitarist in Prince’s funk rock band 3RDEYEGIRL and a valued member of his supergroup, the New Power Generation. Diamonds & Dynamite marks a new direction for Grantis as a bandleader, writing, producing and performing under her own name. We recently spoke with Grantis about her favourite musical gear to use when recording, including PRS guitars, Planet Waves cables and the Foxrox Octron 2. Here’s a live performance of the title track off Diamonds and Dynamite, live at The Bitter End in New York City. What gear do you use to obtain your signature sound? Donna Grantis: This is a tough question, as every component plays such a vital role in determining my sound… I play PRS guitars strung with D’Addario EXL110 strings. I use Planet Waves cables connected to a board of ten pedals, each dialed-in to specific settings, through a PRS Archon 100W and Traynor Bass Master tube amp from the ‘70s (modded by Pat Furlan) through two Traynor YBX212 cabs, in stereo. One pedal, in particular, that I really like is the Foxrox Octron 2. Grantis: The Foxrox pedal is a smooth, super-fat octave pedal that allows me to control the volume of my direct signal, an octave above and an octave below. Grantis: I used this pedal to fatten single note lines, such as the B section of Diamonds & Dynamite. It adds a unique tonal characteristic with increased sustain. 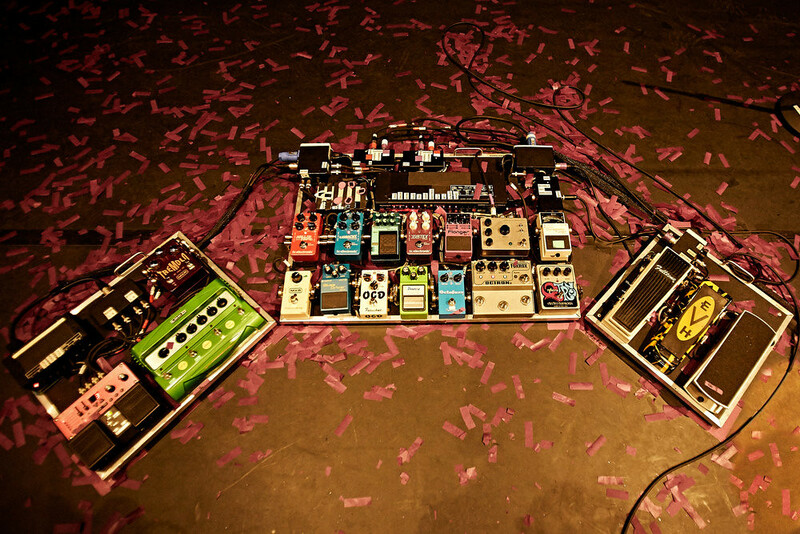 Check out this solid shot of Donna Grantis’ stunning pedalboard setup. How do you recreate your album (guitar) tones in your live set? Grantis: The album was recorded live-to-tape. All of the tones played in-studio can be recreated live. Grantis: Pros: it’s awesome to be able to control the volume/mix of all three pitches (8vb, direct and 8va) independently. Each pitch can be turned on or off with the click of a switch. This allows for a variety of tonal combinations. No cons. How easy is it for you to tweak the device and get the tone/sounds you need? Grantis: Very easy. My favourite setting is currently all knobs at 12 o’clock, however, the pedal sounds great with the dials set anywhere. It’s as easy as plugging in and playing. Here’s another live performance from The Bitter End in New York for the new track "Trashformer." The Diamonds & Dynamite album hit shelves on March 22nd, 2019, via eOne Music.